Coach Saladin Reese is a true veteran of the game. 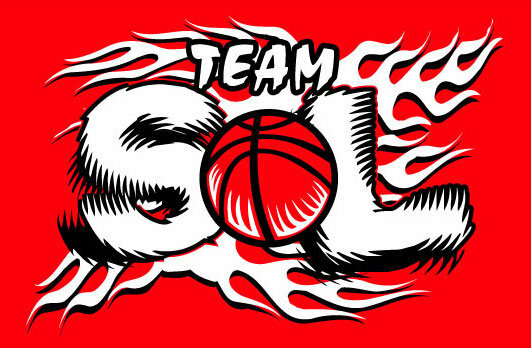 He has coached boys and girls since the early 90's and runs one of DC's most successful programs, Team Sol. 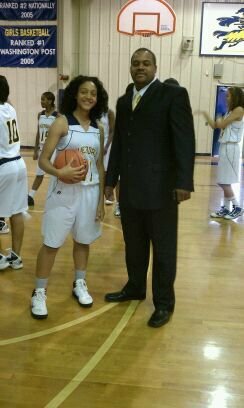 Coach Reese talked to us recently about the girls game and his new gig with Riverdale Baptist. Coach: Well I started coaching boys rec/boys club ball in 93 and moved to girls in 95. I got involved with AAU in 99. I learned by watching what I believe are great coaches like Roger, Lady Sparks, Roscoe from the Silkettes, Gerbet from the Lady Panthers, Gary from Rollingcrest, and Frece, Fairfax Stars. I am not as good as any of the ones I mentioned but I try to take what I have learned over time to apply to where I am now. I say always have fun! Over the years I have coached with Eastern Boys Club, Kingman Boys Club, Montana Boys Club, Silver Spring YMCA..Lady Jaguars..Lady Bison..Team Sol..Martha Washington high school,Northwestern high school, Coolidge high school and now Riverdale Baptist. 695: What do you do to stay sharp and improve your coaching? Coach: I'm a film, dvd and books buff. I talk to numerous coaches I have connected with over the years to just talk and learn from conversations. I love criticism it helps me a lot! 695: How do you feel about the direction of girls basketball right now? Coach: I love the state of girls ball right now although the direction concerns me. Back in the day players always worked hard because it was expected and rankings meant something. Now everyone has a list so every player thinks they are already good. That and the fact that a lot of coaches accept mediocrity and teaching has diminished. 695: Who is the biggest influence on your coaching style? Coach: I would have to say a mix between Coach Webster from Kingman Boys Club, he taught me how to be patient and caring, and Coach Daniels, Team Sol. I love the expectations he puts on his players. 695: What challenges are you facing with the Team Sol program? Coach: New challenges arise year to year. This year our biggest is trying to get more established in the showcase portion of girls basketball. I think we are getting close. Hard work does pay off! 695: What's the deal with the Team Sol/ Love merger? Coach: That merger was something we thought would work out but it didn't. No regrets! 695: How do you set up your summer schedule for you teams? Coach: We leave the event choices up to each coach but we do give input to all. 695: How do you think the new NCAA residency rule changes will affect the DMV area? Coach: I think it's a great rule. Should have always been a rule if you ask me. I'm a big community guy so I think we should represent where we live. 695: How do you handle the criticism that comes with coaching? Coach: Criticism is great. It's my fuel. Keep it coming! 695: How is it working with Coach Richardson and what are your goals for this season? Coach: Working with Coach Rich has been great. I'm learning a lot. Our goal is to get these babies ready for the next level. 695: Who do you like this NBA season? Coach: Lakers all the way since '79! 695: I knew you would say that. Thanks and good luck this season.